Like many of the brands we reviewed, JL Audio was founded in the 1970s. Unlike many of the other brands though, this company did not begin as the brainchild of a scientist or two. 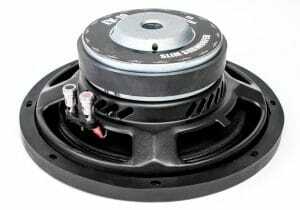 Instead, JL Audio followed the path of Skar Audio in that it began as a hobby of the founders. 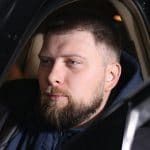 They started by putting together component systems, trying to push them to their maximum capacities, and eventually started selling those custom units to friends and people they knew. 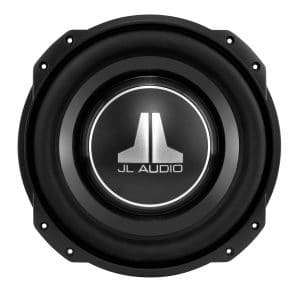 From those humble origins JL Audio rose to become one of the premiere manufacturers of automotive audio equipment riding high off of wins at numerous IASCA World Finals Championships where automotive sound systems are pitted against one another, comparing both sound quality and bass boxing. 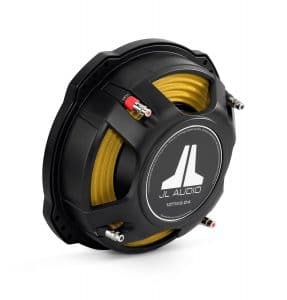 Following their smash success on the biggest stage of automotive audio competition, JL Audio took their specialization in subwoofer systems and expanded the business to where it is today. The 10tw3 is a subwoofer driver designed for competition level performance in the shallow mount category. Even though this is only a 10” subwoofer it still makes use of more power than any other product we reviewed. 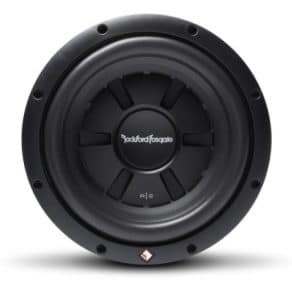 The 400 RMS watts allow this subwoofer to blast bass louder than most. Moreover, with a minimum frequency of only 24 Hz, this subwoofer can accurately reproduce bass notes that are just above the minimum threshold of human hearing. Though, this subwoofer is not really ideal for the midrange production as its frequency range tops out at 200 Hz. That is due in a large part because the 10tw3 combines the solid mica polypropylene cones with a butyl rubber surround. While this allows for decent sound quality and solid durability, it does limit the flexibility a bit reducing the fullest frequency range it might otherwise achieve. Still, one of the best qualities of the 10tw3 is its mounting depth. Even in a shallow mount category, the JL Audio is slimmer than most, requiring a svelte 3 ¼” mounting both top and bottom. The JL Audio doubles up on its mounting focus by using a tab ear mounting system. These tabs allow multiple subwoofers to be mounted next to each other saving more than an inch in horizontal mounting space. 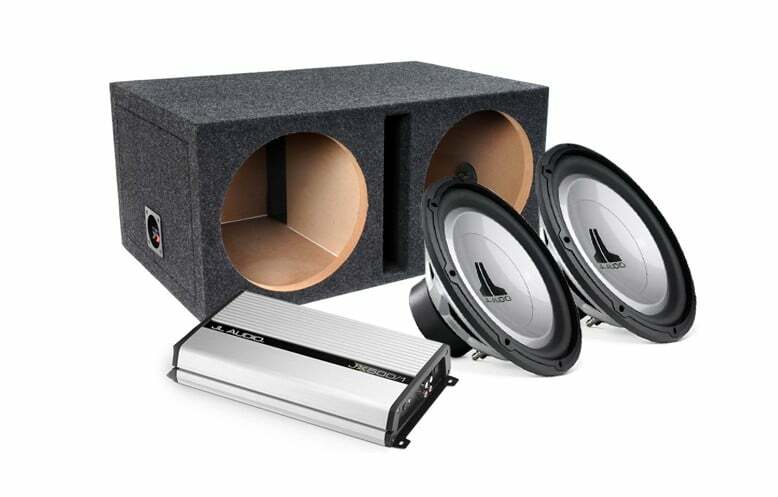 Started in the early 1970s and owing its success in a large part due to its ingenious founder, Jim Fosgate, Rockford is a power player in the automotive audio industry. In fact, it was Fosgate who recognized that human ears did not hear music the same way that early audio equipment produced it leading to numerous advances that ultimately increased the sound quality for all manufacturers. That being the case, it is actually somewhat disappointing that the Rockford Fosgate R2 is not more impressive especially considering the company’s top-tier product lines still lead the industry in numerous categories and remains a fan favorite of audiophiles worldwide. Still, this subwoofer does have a niche which is likely the source of some of its problems but ultimately makes it ideal for a specific setup. This subwoofer was designed from the start to be housed in a sealed enclosure. This is due to a few choice construction decisions that favor longevity over audio quality. For instance, the cone is made out of mica-injected polypropylene for enhanced strength and durability, but the cone is simultaneously wired and woven directly to the voice coil. This allows the cone to replicate the sound without straining itself too much, extending the cone’s lifespan even further. Unfortunately, this means that the cone itself is fairly limited in a couple ways due to its decreased flexibility. For one, this subwoofer features one of the most narrow frequency ranges of 45 to 250 Hz. While the 250 Hz as a maximum is not strictly awful, the 45 Hz low is the highest that we reviewed. This means that fans of hip hop, electronic dance music, and other genres noted for their incredibly deep notes will not have the full range of their voices heard. Of course, as a sealed enclosure subwoofer, the steel frame that is made with vents is designed more for the midrange spectrum of octaves. As such, fans of jazz, rock, and other midrange bass genres will find the R2 more than adequate for their needs. 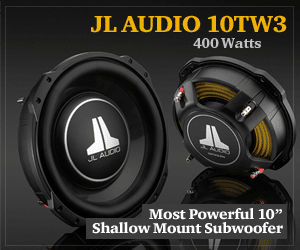 Though, the somewhat low power rating of only 200 RMS watts will still limit the maximum volume you can achieve. Thankfully, the 87 dB sensitivity means you do not necessarily need a lot of power to get a decent volume. Kenwood is giant in the audio equipment industry that has arguably one of the most prestigious pedigrees. Originally established just after World War II in Japan, the brand originally manufactured radios. This focus allowed Kenwood to hone in on what decoding electrical signals required which ultimately led to the development of numerous technologies for various types of head units. However, when it comes to speakers, Kenwood first made their mark in the 1980s. Because the products were made at an exceptionally high level of quality, the brand quickly became the choice for celebrities and consumers alike. 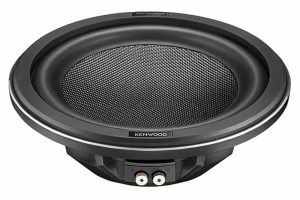 Though, Kenwood has recently seen its reputation take a bit of a hit as the company is no longer known for pushing the boundaries of innovation. That being said, Kenwood does still understand what it takes to make a quality piece of audio equipment and brought that knowledge to bear in the Excelon. While not the most powerful subwoofer on our list, the Excelon is right up there being able to make use of an impressive 350 RMS watts. Still, arguably one of the more impressive aspects of the Excelon is its peak wattage of 1400 watts. While most audio components are rightly judged by their RMS wattage, subwoofers should give a special note to peak wattage. This is because subwoofers will often be forced to make use of high levels of energy in bursts rather than continuously. As such, a subwoofer with a high peak wattage as well as a high RMS wattage will be able to more forcefully and accurately reproduce both the punches and and booms of different music genre bass notes. The Kenwood manages to do all of this with the highest sensitivity we reviewed at 91 dB per watt. This means that the Excelon will be able to produce equal volumes of music with much less power. Ultimately, this plays to the subwoofer’s advantage in a couple ways. For one, its maximum volume will be louder than many other subwoofers with higher RMS wattage rating but less sensitivity. Even better, you can get away with a less powerful, and less expensive, amplifier assuming you do not intend to push the Excelon to its limits. 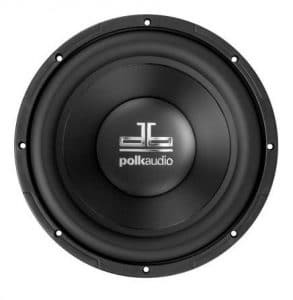 As a company, Polk Audio actually shares a great deal in common with Rockford Fosgate with a distinctly inverted approach. Similarly, Polk Audio also started with a scientist founder in the early 1970’s who understood that the audio technology of the day was not advanced in the subtle ways to produce audio the way it was meant to be heard. The difference being that Polk Audio actually focused on home entertainment systems rather than automotive audio at first. Sadly, this means that Polk Audio does not use the most cutting-edge innovations when it comes to their automotive audio equipment, though they are able to transfer much of their home theater innovations to the automotive market. 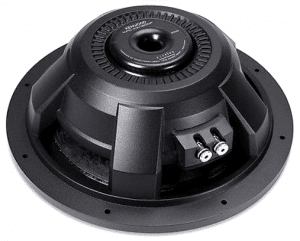 Of course, when it comes to the db1040, that is not the goal at all, as this shallow mount subwoofer was specifically designed to be utilized in marine applications. As a subwoofer intended to be used on boats, the db1040 needs to pay careful attention to the risk of water damage. In doing so, Polk Audio made it a point to use some of the most durable materials found in audio equipment. The polypropylene cone is a common enough material used, but it is also one of the more water resistant as well. The ABS plastic cap may be rigid, but it too is water resistant. Finally, the santoprene rubber surround is a distinct improvement in durability over the more commonly used butyl rubber surround. Altogether, these materials are designed to provide a structural integrity not only in moist environments but through a much wider range of temperatures as well. Of course, there is always a trade-off, and the more durable a material is the less flexible it is. In audio equipment, that rigidity translates to a lower quality audio. As the speaker cone struggles to properly replicate the sound wave of the bass note, its stiffness restricts its ability to do so. This manifests as a muted sound that does not have crisp edges and comes across as muddy. As a brand, Skar is fairly new to the audio equipment market. Started in 2012 as the CEOs hobby, the company now employs twenty people and owns a 17,000 sq. ft. facility. Skar Audio is a full-scale operation that engages in research and development, product testing, and industry showrooms. As impressive as it may be, it does still mean that Skar Audio comes with some limitations some which benefit the consumer and some of which do not. 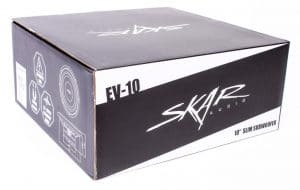 One of the biggest benefits of the scaled down Skar Audio operations is the effect it has on costs. 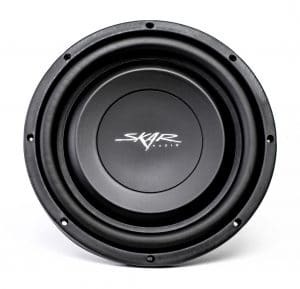 Since the company does not have nearly as high of overhead as some other manufacturers nor do they have the name brand recognition, Skar Audio is forced to keep their prices low to compete with larger and better-known companies. On the flip side, this also means that Skar Audio will have to cut corners where they can in order to stay competitive with brands that can simply buy in bulk and save on production costs. This most notably shows itself in the form of the IX-10’s speaker cone and magnet. The speaker cone is arguably the biggest issue with the IX-10 due to the fact that it is made out of pressed paper. Pressed paper is one of the lowest grade materials used for speaker cones and does not either produce the greatest sound quality nor have a robust structural integrity. As such, the IX-10’s speaker cone will only produce okay sounding lows but is liable to rip and get blown if played at its maximum rated power setting. This is an even larger issue when you consider that the IX-10 has the lowest power rating we reviewed at 200 RMS watts. Thankfully, you do not necessarily need to blast this speaker in order to get a reasonable volume out of it as its 85 dB sensitivity rating is decent for a shallow mount subwoofer. 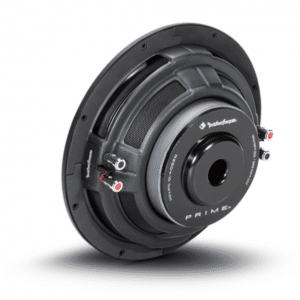 While we rated this as our best budget shallow mount subwoofer, this can actually be a good base subwoofer for those who like to tinker on their own. 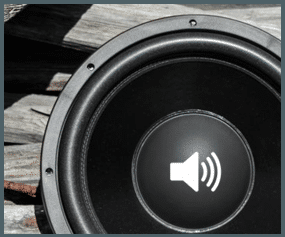 While the power rating of any speaker is important, it is arguably more important for subwoofers than it is for tweeters and mids. This is because a subwoofer is a much larger speaker with a larger cone. As such, subwoofers require more power to flex their cone and replicate the longer sound waves of bass notes. While subwoofer power ratings are gauged in terms of watts, there are two types of wattage ratings that apply. The first, and more relevant, wattage rating is RMS watts. RMS watts are a measure of continuous wattage use and are generally seen as the better category for judging a speaker’s power rating. That being said, subwoofers are one of the few speaker types in which the second type of power rating, peak watts, is important. Essentially, peak watts determine the maximum wattage that a speaker can handle for brief moments. While mids and highs will generally play more or less continuously, subwoofers will often play intermittently depending on the music. In this case, a peak wattage can be important for punchier music. When is comes to subwoofers, there are three general areas where the material is most important: the cone, the surround, and the frame. The cap may also be included in this list, but the cap generally has less of an effect on the quality of the audio produced as well as the longevity of the subwoofer in general. When it comes to the speaker’s cone, this is the most important material consideration. The cone carries with it the unenviable requirement of needing to be both durable and flexible. This often leads to the use of complex plastics like polypropylene. For more advanced systems, glass will be combined with various woven fibers to produce a material that strikes the proper balance between flexibility and durability. When it comes to the subwoofer’s surround, there are a couple materials used, but the best ones are always some kind of rubber. This is because the surround’s purpose is to reduce resonant vibrations that distort the quality of the sound produced. Lesser materials used for surrounds include different types of plastic, especially urethane. In regards to the frame, this generally has more to do with the heat dissipating qualities than anything else. While low-end speakers will go with the less expensive plastic, that material traps heat. Similarly, steel will trap heat as well, though it is far more durable. Generally, the best material for a speaker frame will be some type of aluminum alloy that provides a solid structural durability while providing better heat dispersion. This rating is more accurately noted as a rating of efficiency, but it carries with it meaningful implications. For one, the more efficient a speaker is at translating watts to sound, the cooler it will remain. This allows the speaker to produce sound for longer without wearing out the material components of the cone or surround as quickly. Still, the most important factor of a speaker’s sensitivity involves how much power it takes to produce a certain volume. 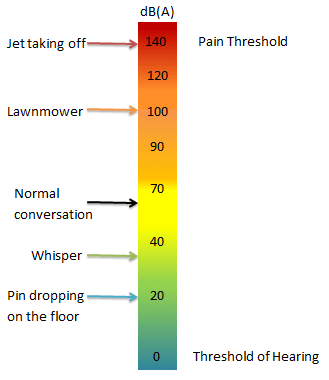 As such, sensitivity is rated in decibels and determines how many decibels a single watt of power can produce. The more sensitive the speaker, the less power it requires to produce volume. In effect, two speaker’s of equal wattage but differing sensitivity will favor the more sensitive speaker for producing more volume. Unlike mids and highs, subwoofers are designed specifically to produce the lower registers of sound. The lowest sound a human ear can hear is capped at 20 Hz. Of course, there are many bass notes well above 20 Hz, so you should not simply look for a subwoofer that can play the lowest note and call it a day. This becomes even more relevant when you consider the mid-lows. Mid speakers are generally focused on playing vocals and other melodic frequencies of music. As such, some of the higher lows played in music can muddy a mid speaker’s sound. 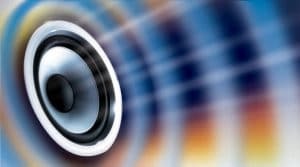 That is why a subwoofer with a frequency range above 200 Hz can actually improve the overall sound quality of your audio system and can be an important factor depending on the genre of music you generally listen to. Subwoofers come in a wide variety of sizes which are judged based on the diameter of their cone. While modern innovations allow for smaller and smaller speaker cones to produce comparable audio quality, volumes, and frequency ranges, there is still no getting around the fact that larger speakers are generally able to produce a wider range of frequencies at a louder volume. In terms of subwoofers, the most common speaker sizes are 10” and 12” in diameter. 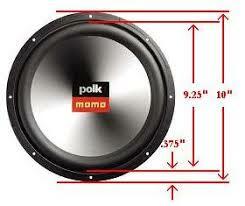 Still, subwoofers can come in sizes as large as 15” to as small as 8”. In fact, some subwoofers even blur the line between a woofer and a mid speaker at 6”. The impedance of a speaker is a measure of its resistance to an electrical current. This resistance is measured in ohms and ultimately determines how easily it can translate the signal from a head unit or amplifier into sound. Generally, a lower impedance will produce a better quality of sound. This is because the digital signal suffers less distortion through a less resisted set up. 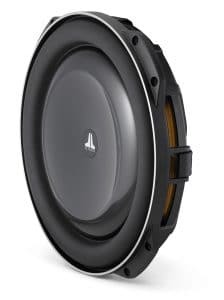 Though, this does carry with it the greater potential of durability issues over time as the voice coil of the speaker will be handling a stronger electrical current. Some speakers aim to alleviate this issue by providing dual voice coils or DVCs. The DVC allows you some leeway when choosing how to setup your speakers often offering the option of either a 2 ohm or an 8 ohm. Still, the most important thing to remember is to match your speaker’s impedance to that of your amplifier to reduce the risk of damage. While everyone would love to have the best subwoofers available, that ultimately involves a serious financial investment. Though, that kind of investment will extend well beyond the subwoofers themselves. For this task, the amplifier and the head unit will also be major cost factors. That is why the best shallow mount subwoofer cannot necessarily be judged exclusively on the audio quality produced. Of course, if you are looking for the absolute best audio quality, the JL Audio and Kenwood are great places to start. While the Kenwood cannot handle quite as much power, its larger cone and superior sensitivity place it on equal or better footing than the JL Audio. Still, if you are in the market for a shallow mount subwoofer, chances are you do not have a wealth of space to work with. In that case, twelve inches might be too large and you would do better with the smaller ten-inch subwoofers from JL Audio. 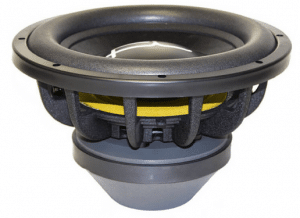 When you combine the smallest mounting depth with the ear tab mounting system, the JL Audio is arguably the best pound for pound shallow mount subwoofer we saw. I like your passion, “If you build it will come” A new youtube page is being created to build, test and critically listen to subwoofers and mids and highs, using state of the art LMS software. I, as well am tired of bogus claims and ts parameters that are untrue and over stated. let the games begin.